Fred Astaire would prove that he could dance very well indeed. 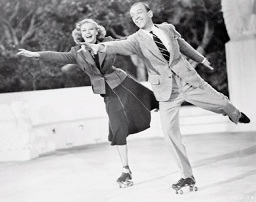 His dancing partners eventually included the leading names of the day – Eleanor Powell, Judy Garland, Cyd Charisse, Rita Hayworth, Audrey Hepburn – and Ginger Rogers. Of all his dancing partners, it was his performances with Ginger Rogers that were the most memorable. The audiences went wild and demanded more. It was sheer magic. But they only made ten movies, of which only the first six were the best. At that time, Ginger Rogers was a budding star who had just found her break. If she had continued to dance with Fred Astaire, the exposure should have benefited her. Yet they went their separate ways after seven years. If they were successful and making money, surely it only made sense for them to continue working together. Why was their partnership so short lived? Fred Astaire was born on 10 May 1899 to Frederich Emanuel Austerlitz and Johanna Geilus. His father came from a family of brewers. He migrated to the US and eventually settled down in Nebraska where he married a schoolteacher. Their daughter Adele was born in September 1896. Fred and Adele started dancing in public from 1905. They had one advantage over other child stars - they had the supervision of their mother. Fred Astaire then danced solo in the Broadway performances of “The Gay Divorce.” The press could not decide whether he was better as a solo dancer or whether he sorely needed a dancing partner to replace his sister. But Astaire seemed to be in no hurry to choose his next partner. 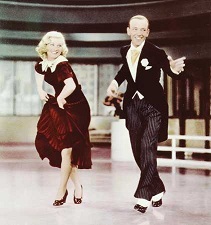 Although she had acted in some 20 movies, she was still only a budding starlet compared to Fred Astaire. Their partnership would catapult her into the big time. But Astaire was so versatile that he could dance with practically any partner. He married Phyllis Livingston Potter in July 1933. The first movie they made was “Flying Down to Rio” in 1933. Astaire had already appeared in previous theatre versions of “The Gay Divorce.” Louis Brock, the producer of “Flying Down to Rio”, did not want to make a film version of “The Gay Divorce.” The Hays Office objected to the title because they thought that no divorce could ever be gay or happy. But Pandro Berman, the producer for RKO (Radio Keith Orpheum) Pictures had no such qualms so he made a movie out of it. They changed the title to “The Gay Divorcee” for release in the US to pacify the Hays Office. This movie became the most profitable for RKO Pictures to date. In 1935, they made “Roberta”, followed by what was probably their best movie together, “Top Hat”. This movie cost the studio some $600,000 to make, which was expensive in those days. It was a big gamble especially since Fred Astaire and Irving Berlin could claim 10 per cent of the profits. Ginger Rogers was paid only her modest salary. The film eventually grossed $3 million. After this phenomenal success, the decline began in 1936 with “Follow the Fleet” and“Swing Time”. Fred Astaire wanted to be paid more. He was then paid $1,500 per week plus an additional $500 weekly while making a film. When the negotiations between Astaire’s lawyer and the studio broke down, the studio punished him by not offering him any more work for the time being. That way, the studio need not even pay him the extra $500 per week. The row became public. There were also hints that relations were strained between Astaire and Rogers. Astaire let it be known that it might not be wise to continue making motion pictures together. He remarked that they had “done almost every variety of dance.” He was worried that the public might wonder if they weren’t merely repeating themselves. Finally, it was announced that Astaire would not make more than two pictures a year. 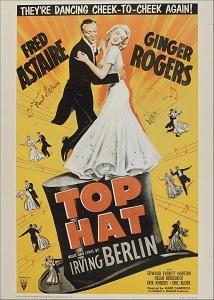 Rogers was required to make four films a year, two with Astaire and two without him. In the event, the movies that she made without Astaire are now largely forgotten by the movie going public. From 1937, the slide downwards was even more serious. In 1937, they made “Shall we Dance?” They found it difficult to come up with novel ways of dancing. So the choreographer, Hermes Pan designed a dance for them on roller skates through Central Park. In 1938, their next movie was “Carefree.” The year 1939 was their biggest flop – “The Story of Vernon and Irene Castle” – often referred to as just “Castle.” The studio balked at paying the high expenses of a composer to write a complete score for the movie. For their past movies, the composers had to be one of the big four – Cole Porter, Vincent Youmans, Jerome Kern or George Gershwin. The score for the“Castle” was a rehash of old nostalgic songs. Their last movie together was “The Barkleys of Broadway” which was released by MGM only in 1949. Initially, Judy Garland was supposed to dance opposite Astaire. But she had to be withdrawn due to health problems. Ginger Rogers was chosen to replace her. So their last movie together was due to accidental factors rather than planned from the start.